Last weekend Tom, Mary and I geared up for our final pre-ride/camp-out before we head out West for Oregon Outback (a 360-mile dirt road ride across Oregon). 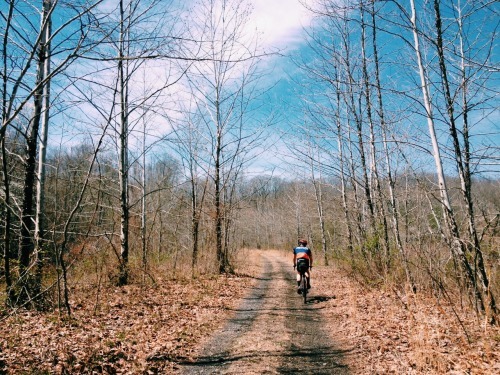 I have always wanted to explore the appalachian landscape, and glacial cave systems out near Hocking Hills so what better way to explore the region than high mileage bike ride. My goal with the route was to include as much dirt and distance as possible to get us ready for what our first day goal for the Oregon Outback is; to reach The Cowboy Dinner Tree for our 7:30 PM reservation (115 miles of dirt roads in under 12 hours). Day one was tough. 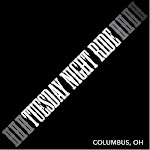 I had planned for us to ride about 90-ish miles west of Athens, to Tar Hollow, then north to Hocking Hills from there. At mile 15 we hit what looked like a fantastic double track gravel rail-trail, the catch was that all the train bridges that once crossed the deep creek gullies had been removed. Rather than turning back and taking a major paved detour around the trail, we all chose to push forward, a decision that ultimately made for a lot of hike-a-biking, 6 creek crossings, a 3-hour time penalty, and more water consumption than what we had planned for that distance. At mile 30, it was 3 o’clock, we were running low on water, and had (what we thought at the time, “only” 60 miles to go…). At this point we were solely focused on finding easy water and going the distance. We found salvation at a glorious water spigot in Tar Hollow which would be the only water we would take until mile 90. Gradually, night rolled in, hiding the landscape from view. We could easily feel that we were nearing Hocking Hills as the grades became steeper, and steeper (13-25% grades with heavy bikes!!). I wish we could have seen some of those roads in daylight. Climbing steep, loose, cat litter gravel, and then bombing down the backside becomes a different, smoother, blacker thing in the cool night. Our headlights flashed scenes of rock walls dripping wet and fern covered as we pressed on in survival mode. The whole time I was thinking “my mom and dad are going to kill me for torturing my sister like this!” but the kid won’t crack. She’s tough stuff.